The successful debut of the Soyuz-2-1v rocket last month might rekindle hopes for the development of much more powerful 21st-century incarnations of the historic Soyuz launchers. If ever approved, the Soyuz-2-3 project would be the next in line to go from the drawing board to the launch pad. Like its just introduced predecessor, Soyuz-2-3 would sport a mighty NK-33 engine on its core stage, however it would also feature four traditional strap-on boosters from the Soyuz family, thus enabling to create a launch vehicle with a payload mass of around 10 tons to the low Earth orbit. From the day when the Soviet government scrapped the ill-fated N1 rocket in 1974, the creators of its powerful NK-33 engine sought another job for their state-of-the-art creation. A long-shot hope to marry NK-33 with the Zenit rocket at the turn of the 1980s was lost to the newer RD-170 engine. However by the end of the same decade, the industry started looking at various ways of upgrading the historic Soyuz family of rockets within a research project code-named Rus. However economic problems in post-Soviet Russia mostly limited the work to the development of the Soyuz-2 rocket. Still, in 1996, RKK Energia, the nation's key contractor in manned space flight, proposed a much more radical upgrade of the Soyuz rocket called Yamal, which would incorporate either the NK-33 or the RD-120.21 engine. Engineers concluded that by using a single NK-33 on the rocket's second stage, the Soyuz vehicle could increase its payload by 50 percent. With the Russian space budget in dire straits, RKK Energia made attempts to find private investors for the project. In 2000, these efforts produced a short-lived venture funded by an Australian businessman and aiming to build a commercial space port on Christmas Island in the Indian Ocean. 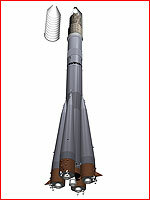 A slightly revised version of the Yamal rocket based on Christmas Island became known as Avrora (a Russian for Aurora). It would still rely on the NK-33 engine to propel its second stage. Although the project remained on paper, it provided a roadmap for future upgrades to the Soyuz family by the time the Russian economic situation improved in mid-2000s. The designation Soyuz-2-3 first emerged in public around 2005, when RKK Energia decided to rely on the Soyuz family of rockets for launching its prospective Kliper space plane. At least four versions of the rocket were considered, which would use various combinations of engines, such as RD-191, NK-33-1, RD-0120.10F and RD-0155. These configurations could lift from 14.8 to 15.3 tons. Like the Soyuz-3 launcher, the Soyuz-2-3 initially borrowed the body dimensions for its 1st and 2nd stages from the Avrora project. The first stage of Soyuz-2-3, traditionally comprised of four conical strap-on boosters, would be equipped with the brand new RD-0155 engine developed by the KBKhA design bureau in Voronezh and burning a mix of kerosene and liquid oxygen. The top section of the 2nd stage (also known as the "core" or a "sustainer" stage) would have a cylindrical shape, as opposed to the conical shape in all earlier versions of the Soyuz rocket. It would enable the core stage of the Soyuz-2-3 to carry as much as 40 tons more propellant in comparison to the core stage of the Soyuz-2. (In March 2007, TsSKB Progress said that a 50-ton increase in propellant load would be achieved with a larger diameter core stage.) 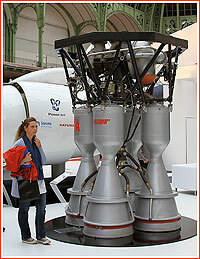 Like in the Avrora project, the second stage on Soyuz-2-3 would be equipped with a modified NK-33 engine. Designated NK-33-1, the modified engine would be able to develop up to 200 tons of thrust -- an increase from 150 tons in the original version used on the N1 rocket. 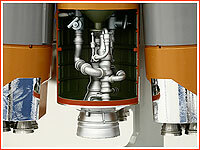 The engine could be gimbaled up to 15 degrees, eliminating the need for steering thrusters, traditionally present on all booster stages in the Soyuz family. The Soyuz-2-3 could then pave the way to the Soyuz-3 rocket, which would incorporate a new third stage burning more powerful hydrogen propellant instead of the kerosene used on the Soyuz-2-3. Proponents of the Soyuz-2-3 and the Soyuz-3 projects argued that it would be the cheapest way to produce a launcher in this weight category. They banked on using the existing cache of as many as 70 NK-33 engines left from the N1 program, to build an initial batch of Soyuz-2-3 rockets. Later, profits from commercial use of the vehicle could be re-invested to jump-start mass production of NK-33-1 engines. As of June 2005, the preliminary design of the Soyuz-2-3 project was expected to be completed at TsSKB Progress in Samara by the end of that year and the "working documentation" to be produced during 2006. As of 2006, the project was expected to be completed by 2012. During the Dvigateli 2006 show in April 2006, Sergei Tresvyatskiy, the director general of OAO SNTK Kuznetsov, promised to initiate test firings of existing NK-33-1 engines in mid-2007. Russia's 15-year Federal Space Program, adopted in 2005, allocated 4,000 million rubles for the Rus-M development program, which encompassed upgrades to the Soyuz family. It envisioned the development of a launch vehicle with a capability of launching 11 tons into the low-Earth orbit during a time period from 2007 to 2010, followed by a vehicle with the 15-ton capability to the same orbit and 3.4 tons to the geostationary orbit, which would be developed from 2010 to 2015. At the beginning of 2006, RKK Energia and TsSKB Progress agreed to a three-stage development plan for the Soyuz-2-3 project. The first version of the rocket was to carry 11 tons into low Earth orbit, delivering commercial and military satellites. In the second development phase, the payload would be increased to 13 tons, thanks to the introduction of the RD-0155 engine on the first stage. This upgrade would enable the vehicle to carry the "light" version of the Kliper space plane, then under consideration. Finally, during a third phase, the payload would grow to 15 or 16 tons or even more, giving the rocket enough power to launch the "heavy" version of the Kliper. 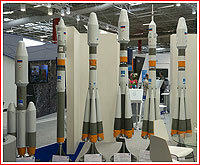 By 2007, an entirely new architecture of the Soyuz-2-3 launcher also emerged, as evidenced by a scale model appearing at various air shows around that period. The new design featured cylindrical rather than conical boosters of the first stage, aiming to increase their propellant load and probably simplify their manufacturing. However such a configuration bore very little resemblance to the Soyuz family. In addition to RKK Energia, which sought Soyuz upgrades for its future manned vehicles, the Russian military apparently also expressed interest in upgrades to the Soyuz family. According to a regional edition of the Kommersant daily, the commander of Russia's space forces at the time, Colonel General Vladimir Popovkin visited TsSKB Progress on June 5 and 6, 2006, to discuss the issue. On March 2, 2007, the Soyuz-2-3 project became the focus of discussion with the Chairman of the Russian Duma (parliament) Boris Gryzlov, who visited TsSKB Progress with an entourage of regional officials and subcontractors. Around that time, an election billboard with the insignia of Vladimir Putin's ruling Yedinaya Rossiya (United Russia) party appeared on the major avenue in Samara, the home of TsSKB Progress, promising the development of the Soyuz-2-3 rocket from 2008 to 2010. The project showed first signs of moving forward, when a long-promised demo test of the NK-33 engine finally took place on June 2, 2008, in the presence of a number of high-ranking civilian and military officials from Moscow. The engine successfully fired for 266 seconds. Still, Designer General at TsSKB Progress, Ravil Akhmetov, told the RIA Samara news agency that the idea of reviving the NK-33 engine within the Soyuz-2-3 project faced skepticism among some officials. 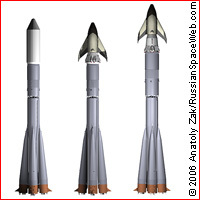 In 2004, engineers at TsSKB Progress also conceived the Soyuz-1 vehicle, which utilized a modified core stage of the Soyuz rocket powered by a single NK-33 engine, but without the four traditional strap-on boosters. The vehicle could serve as an intermediate step toward the development of the Soyuz-2-3. After several years on paper, the Soyuz-1 project (later renamed Soyuz-2-1v) started moving forward around 2008. At the same time, TsSKB Progress developed a preliminary design of a less radical version of the Soyuz-2-3 vehicle. 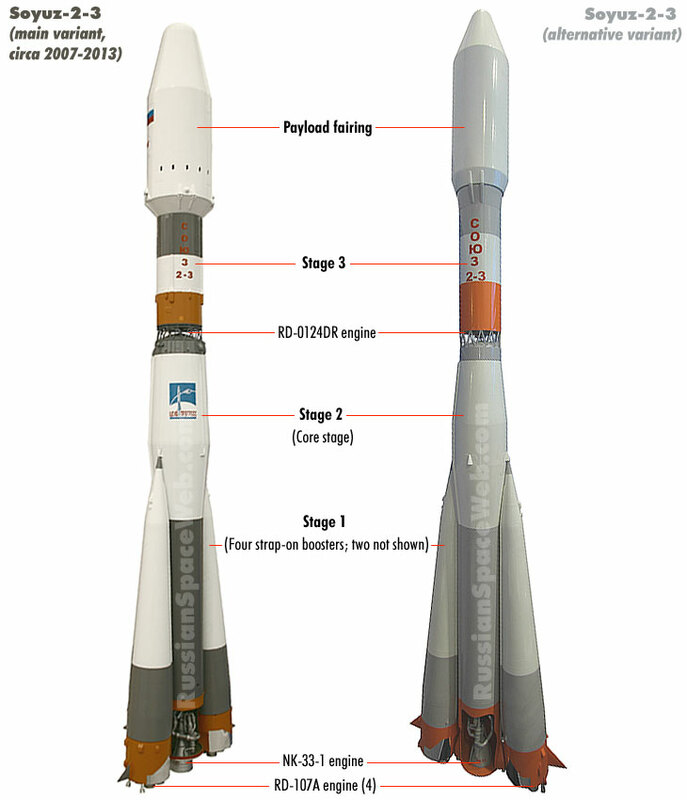 It would use the core stage developed for the Soyuz-2-1v rocket with an NK-33-1 engine and four boosters from the existing Soyuz-2 rocket, featuring RD-107A engines. The third stage would also be borrowed from Soyuz-2 without major changes. This design would enable a relatively easy transition from Soyuz-2-1v to Soyuz-2-3 by "re-attaching" four strap-on boosters to the Soyuz-2-1v rocket. On August 1, 2011, NPO Energomash disclosed that at the meeting of its Scientific and Technical Council, NTS, three days earlier, top propulsion experts in the nation had reviewed proposals for the RD-193 engine intended for the "prospective versions" of the Soyuz rocket. The RD-193 could replace the NK-33 engine when the existing cache of these Moon Race-era engines would be expended. Finally in 2013, KB Khimavtomatiki design bureau, KBKhA, in Voronezh announced that it had resumed work on the RD-0124DR engine, which was intended for the third stage of the Soyuz-2-3 rocket. With the successful introduction of Soyuz-2-1v in 2013, the door was open for further modifications of Soyuz rockets. Obviously, the Soyuz-2-3 would be the most likely beneficiary of the latest breakthrough. However, the Russian space agency is yet to indicate, which route it will take in its launch vehicle development strategy, especially given the latest proposals from TsSKB Progress for the Soyuz-5 rocket, competing projects from GKNPTs Khrunichev, such as Angara-3, and the prospects of Russian-Ukrainian cooperation in the use of Zenit boosters. ****Inclination 5.3 degrees toward the Equator. **Man-rated version of the launch vehicle. **Mass of the Kliper spacecraft with emergency escape engines and the launch vehicle adapter. A heavily redesigned version of the Soyuz-2-3 rocket, which was first displayed around 2007, and then resurfaced in 2011. Credit: Mark Wade.